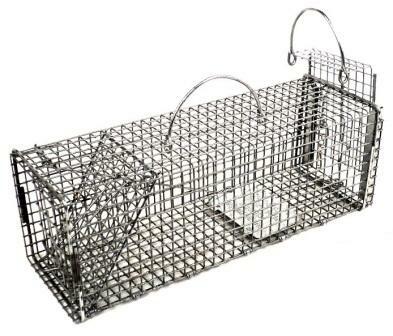 Model 602SS is a professional live trap with an easy release door for chipmunks, gophers, rats, and similar size animals. It feature a very strong wire frame with tighter mesh patterns and extra reinforcing steel rods welded to the frame for even greater strength. These traps have the same great design as our Original Series traps with stronger materials and more demanding specifications. Tighter mesh patterns not only give the trap additional strength, but also prevent critters from reaching into the trap and stealing bait, and reaching out of the trap and damaging lawns, roofs, decks, and other property. The easy release door allows for the easiest way to release trapped animals and to bait the trap. Grid Construction = ½" x ½"
These are made with the same great design, materials, and specifications as our Professional Single Door Traps, with the addition of a convenient rear sliding door that allows for the easy baiting, and transferring of animals. The rear sliding door feature ultimately keeps the handler out of striking distance because he never has to get close to the trapped animal. It eliminates the need to reset the front trap door to release the animal. It also eliminates the need to reach all the way through the trap to position the bait beyond the trip pan. With a rear sliding door, the handler just unhooks the safety snap on the rear sliding door and pulls up on its handle. This is the easiest way to release a trapped animal, or bait a trap. From 51ncheel of Lake of The Ozarks, Missouri on 6/26/2012 .